Tania McCartney is an author of children's books and adult non-fiction. Recent books include Riley and the Grumpy Wombat: A journey around Melbourne, and Australian Story: An Illustrated Timeline. She's also an editor, publisher and founder of Kids Book Review. It’s almost Christmas, and Mr Mellops is reading the newspaper . . . an article on Christmas decorations. My how he loves the festive season! Showing his boys the article, Casimir, Isidor, Felix and Ferdinand take it upon themselves to begin the hunt for a gorgeous tree to tiz up with festive bling. Isidor finds a tree in the forest. Casimir does the same. Ferdinand, too – and let’s not forget Felix. But does one family really need four trees? A kindly Mr Mellops suggests the boys head outdoors to see if they can find someone else in need of a beautiful festive tree. The boys approach the orphanage. But they already have a fine tree. They approach the hospital. But a splendid tree is already in place. Next is the prison, but the inmates are already kitted out with their own little tree (and besides, there’s not much more room in those teensy cold cells!). Dejected, the boys trudge home, when they come across a little girl, weeping quietly in the street. Could she use a tree? Could her ailing grandmother benefit from a splendorous spruce? Could a lonely old lodger need a festive boost? What else can the boys do to make their Christmas celebrations more prosperous. This sweet little piggy family shine in Tomi Ungerer’s heartfelt Christmas tale. Swoon-worthy, bi-colour illustrations hark back to a retro past, and are truly touchable. Warm, festive and tender, without an ounce of schmaltz, Ungerer continues to create modern classics that are an absolute must for book collectors. Christmas Eve at the Mellops’ is published by Phaidon. We all know and love Jackie French’s iconic Wombat – Mothball – and in this gorgeous festive book, featuring illustrator Bruce Whatley in serious bells-and-bauble mode, is pure escapism, for big and little kids alike. It’s Christmas Eve and Mothball is lounging around doing what he does best. Scratching. Lazing. Scratching a bit more. Until he smells . . . da da de daaa . . . carrots! Yes, that’s right. Though, why on earth anyone would want to plate up some carrots and just leave them there, awaiting some fantastical creature to come along and nibble them? Perhaps a creature starved and thirsty after flying through the night to the point of exhaustion . . . No mind! Mothball is happy to oblige and take care of any required nibbling. The appearance of some strange creatures with antlers and bells, angling for a nibble? Don’t like the look of these stately beasts. No, no. Walk off in a huff. Feeling tired. Ahhh . . . Here is a nook, in the bottom of this cumbersome, sleigh-like vehicle . . . perfect for a nap as it takes off into the heavens en-route to who-knows-where . . . The nonchalance. The dry voice. The gentle humour. The priceless illustrations that make you want to reach out and squish and squeeze that adorable wombat . . . it’s all there in yet another Jackie French winner. Christmas Wombat is a festive must-have for any Aussie child. Be sure to read it Christmas Eve . . . with a closely-guarded stash of carrots for errant wombats. Christmas Wombat is published by HarperCollins. Are you counting the days ’til Christmas in the Boomerang Books Advent Calendar? Everyone loves an excuse to count down to D-Day, and this time the chocolate is virtual – with sweet treats being proffered in the form of a gorgeous line-up of Australian books. After running a survey in November, Boomerang Books is featuring the top 24 most popular Aussie kids’ books, which will be revealed day by day on the Boomerang Blog. With Shoes from Grandpa by Mem Fox at #24, I wonder which Australian tome will appear at #1, come Christmas day? Follow along and see! In the meantime, don’t miss your opportunity to win a serious stash of books valued at $5000 by entering our Santa’s Sack Giveaway – the biggest ever book giveaway on Boomerang Books. That’s over 200 books, mostly thanks to the good people at Random House, and four lucky people will each win approximately 50 of the books on offer. It’s a Christmas book bonanza! If you’re struggling for book ideas for Christmas, be sure to check out our Christmas Catalogue, which is busting out all over with fabulous bookish suggestions. It’s even divided into helpful topics, so you can pinpoint the right book quickly (after all, you knew Boomerang Book has over 11 million titles listed, right?). If, like me, you’re always after another stunning children’s book, this Kids’ Reading Guide is an absolute must-flick. Oh – and one more teensy thing (that’s actually quite big, if you ask me) . . . Boomerang Books is offering gift wrapping with purchase for just $3.50, with the opportunity to send a personal message with your gift. Looks like a bookish Christmas is all wrapped up. Happy shopping! Nancy Bentley, the eldest of seven children, was born in 1914 and was raised in Smith O’Brien’s cottage in the ex-penal colony of Port Arthur. In 1920, when Nancy was just 6 years old, the HMAS Sydney docked briefly in Port Arthur harbour. Playing outside and listening to the navy band with her siblings, Nancy was bitten by a whip snake. Knowing she would never survive the journey to Sorrell for treatment, Nancy’s family knew their only hope was to seek help from the HMAS Sydney. Rowing her to the warship in a small rowboat, Nancy’s father begged the captain to take his daughter onboard and treat her – which he gladly did – but therein lie a curious problem. Under the king’s orders, it was forbidden for females to be aboard a naval ship, so in order to keep Nancy under the watchful eye of the ship’s surgeon, the captain announced he would have no other choice but to enlist Nancy in the Royal Australian Navy . . . as Macot Bentley 000001 – Australia’s first female soldier. This gorgeous book by Canberra author Tracey Hawkins gave me goosebumps all the way through. Warmly told, the story of this lovely little girl highlights the rich tapestry of historical events that make our country so unique. Beautifully-designed and featuring truly lovely watercolour illustrations by Jacqui Grantford, the book comes complete with a facsimile of Nancy’s Certificate of Service and an author’s biography note detailing her story. This heartwarming tale is one children all over Australia will feel proud to know. Nancy Bentley: The First Australian Female Solider is published by New Frontier. Welcome Alice-Miranda, it’s so lovely to e-meet you! I hear you are just seven and one-quarter years old yet you get up to some mighty adventures. Would you call yourself a brave kid? Good morning Tania, it’s lovely to e-meet you too. I’m very excited because I’m almost eight now – this year has just flown by. No I don’t think I’m especially brave but I do love adventures. What’s life like at Winchesterfield-Downsfordvale Academy for Proper Young Ladies? School is always very busy and I absolutely adore it. My favourite class is definitely English with Miss Reedy – she’s as mad about books and reading as I am. Our cook Mrs Smith makes the most delicious food – my favourite dinner is rack of lamb with mashed potatoes, carrots, zucchini and lashings of thick gravy and her chocolate brownies are scrumptious. I like them for afternoon tea with a lovely glass of ice cold milk. I think we’re especially fortunate to have so many great teachers and people who work at the school. Mr Charles has a wonderful garden and Mrs Howard is the sweetest housemistress and of course Miss Grimm and Mr Grump make it feel like one big family. What was it like to have a book series written about you? It’s a bit strange really but lots of fun. My best grown up friend Jacqueline Harvey writes them. You’ve already had some awesome adventures through four spectacular books. Which adventure has been your very favourite and why? Mmm, that’s a very difficult question because every one of my adventures has been special. You know that when I first came to school Miss Grimm hadn’t been out of her study for rather a long time and so it was lovely that we became such good friends in the end. On holidays we had so many mysteries to solve and I was very glad that Aunty Gee wasn’t hurt by those terrible kidnappers, who were actually after Mrs Oliver (but the two ladies look so alike that they took the wrong person). Can you give us the dirt on WDAPYL Headmistress, Miss Grimm? Miss Grimm is one of the most wonderful people I know. When I first met her she was rather cross and seemed quite upset, but I discovered that she had a badly broken heart, and when I met Mr Grump on my wilderness walk and convinced him he should come back to school and see her it was wonderful – and then they got married and Miss Grimm hasn’t stopped smiling since. She’s very elegant and she always looks beautiful and she’s just made a decision (which I can’t tell you about just yet) which has made the girls and staff happier than they have ever been. Ooh – how exciting. Can’t wait to hear more. I’ve been wondering . . . did you get seasick during Alice-Miranda at Sea? No, I seem to have good sea legs. I hadn’t been on The Octavia before but I have been on some other large boats. My Mummy’s poor cousin Lady Sarah got very sick and so did her two daughters, Poppy and Annie. You’ve certainly overcome some challenges. How important is it for kids to remain positive and determined? I think being positive is one of the most important things of all. No matter what happens, if you can try to find something good in every situation, then life just seems so much better. It’s the same with people. Nobody’s perfect but everyone has strengths and I like to believe that people have good hearts. Sometimes they might not behave quite as well as you’d hope but there’s usually a reason behind it. Rather than looking for a person’s bad points it’s much better all-around if you can focus on the positive. Determination will help you get through all sorts of situations. I think my friend Jacinta is one of the most determined people I know. She trains so hard and wants to get to the Olympics for gymnastics. I’m sure that she’ll get there and I can’t wait to go and see her. Would you say that Jacinta Headlington-Bear is your very best friend? My two best friends at school are Millicent Jane McLoughlin-McTavish-McNoughton-McGill, but she prefers to be called Millie, and Jacinta Headlington-Bear. Millie is lots of fun and she’s quite straight to the point. Jacinta is too actually, and can be a little blunter than Millie. Jacinta has a hard time with her mother and father because they’re not around for her very often. But it was lovely when her mother came to Aunt Charlotte’s wedding and I really think there was a great change for the better between the two of them. What’s author Jacquie Harvey really like? Jacqueline Harvey is very busy. I don’t have nearly as much time with her as I would like. She’s been teaching me a few writing tricks of my own though (I love writing too and I’m planning to write some books with her help – stay tuned for more exciting news about this soon). Were you named after anyone in particular? Mummy always liked the name Miranda and Daddy liked Alice so they tried them out together, Alice-Miranda. They said that it just worked. What your favourite ice cream flavour and why? My favourite ice cream is vanilla bean with chocolate topping. It’s scrumptious! Talkative, happy, positive, determined and friendly. Can you give a sneak peek at your next adventure? I have a feeling it might be somewhere very special indeed! I’ve just had the most wonderful time in New York City. I went to school there too for a month at Mrs Kimmel’s School for Girls on the Upper East Side of Manhattan. I made some good friends, Lucinda, Ava and Quincy and would you believe I ran into an old friend from Winchesterfield-Downsfordvale (but you’ll have to wait and see who that was). Mummy and Daddy were in New York to oversee the grand re-opening of Highton’s on Fifth which is a beautiful department store. We stayed in our apartment at the very top of the building overlooking Central Park. Daddy and I did lots of exploring in the city – poor Mummy had a few problems at the store so she wasn’t able to come out as often as she would have liked. One of my favourite places was The Metropolitan Museum of Art – the locals call it The Met and we had our art lessons there. It was also where I met someone very special – but I’m not telling who that was either. You’ll have to wait and read all about it in February next year. I can’t wait! Your wonderful escapades have recently been published in the USA and also in Indonesia – congratulations! Will you head over on holiday to visit everyone and celebrate? Next year I am hoping to do lots of travelling to meet my friends all over the place. I think we’ll start in Australia and then head to the United States and also to England where my first adventure will be published in March. I might try to skip over to Turkey where the first book is due out before the end of this year and who knows, perhaps Indonesia on the way home. Jacqueline Harvey is also very keen to take me on a trip to New Zealand too. Happy travels, Alice-Miranda, and do come visit us again soon! Learn more about the lovely Alice-Miranda at her very own blog, and don’t forget to check out what author Jaqueline Harvey has been up to, at her website. Talented mother and son team Sally Morgan and Ezekiel Kwaymullina reunite in this beautiful picture book, about a young lad and his dad. Dad is not afraid of sharp shells, crazy crabs or tumbling sandcastles, no no. Angry dogs don’t deter him. Neither giant waves. Slimy seaweed? Not a problem. But there is one thing he’s a bit afraid of… Lucky his young son is not. This is a sweetly simple story about the friendship between father and son, doused with loads of sunshine and delicious humour. The pages are typically tropical or islander Australian, giving it a decidedly patriotic feel. Illustrations by Matt Ottley showcasing beautiful beach and oceanic scenes are a true highlight, as are the faces on father and son as they romp warmly in the sunshine. Particularly loving the inset images and comic-strip style pages, combined with gorgeous full-page spreads. This is a gorgeous book that would make a perfect gift for dad at Christmastime (or stashed away til Father’s Day). Me and My Dad is published by Little Hare. It’s nearly Christmas Eve at the toyshop and every toy is hopeful they will be snaffled for the festive stocking. All the shiny new toys are the most popular, of course . . . they come and go quickly, and never last long enough to make friends of the other toys. At the very back of the toyshop, covered in a layer of dust, an old fashioned wind-up toy sits forgotten – its glory days long past. The older toys well remember Space Ride and its fabulous whirling glee – but alas, this vintage toy needs a key to get whirling, and that key is long gone. The older toys try to get Space Ride working again. They try Annie’s pretty golden key. They try Chirpy Chick’s small silver key and Doris the Dial-Up Typewriter’s key – to no avail. The new toys just don’t understand. They don’t need keys to light up their whiz bang special features! So, how can the older toys recover Space Ride and show the new toys just how fabulous a vintage toy can be? There’s one key left to try . . . can the toys recover it without scaring the pants off the elderly shop keeper? The highlight of this book is the lustrous Pixar-style animation – so realistic, you can imagine it popping to life on a movie screen. From the endpapers to the divine characters and typefacing, this latest book by the masterful Bruce Whatley is a true delight in retro design. Co-written with Whatley’s son Ben, this is a simple, sweet story with a strong illustration focus. Tin Toys is published by Random House. Anh Do – Vietnamese refugee, comedian, Australian, and all round lovely guy has a powerful tale to tell. His best-selling autobiography – The Happiest Refugee – has won numerous awards, including Best Non-Fiction Book of the Year at the 2011 Indie Awards, and tells the tale of his original voyage to Australia aboard a crowded fishing boat – the quintessential horror journey for any refugee. 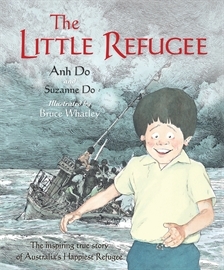 In this beautiful picture book, an abridged retelling of this fateful oceanic journey, Anh and his wife Suzanne tell of a voyage of courage and hope. After fighting for Australia and America in the Vietnam War, Anh’s dad needs to take his family to safety. There is no other way. They must leave everything behind and board the boat. Anh was just a wee lad when he left his war-torn home – along with his mother, father and baby brother – in search of a better life. A group of 40 men, women and children crammed into that small fishing boat and set sail, though searing heat and wild storms. The boat was even robbed by pirates, Anh’s baby brother Khoa dangled dangerously over the side of the boat, ready to be tossed asunder. The pain and fear his parents would have experienced – I can’t even imagine, yet, the family held hope. Indeed, even when the boat was rescued and Anh began a new life in Australia (which beset a whole other set of challenges) his mother oft repeated that their fortunes would one day turn around. And indeed, through perseverance and faith, they did. This is a beautiful, touching and insightful book. Watercolour illustrations by the masterful Whatley have a Japanese-style feel in their construction, and perfectly wrap this remarkable story – one experienced by so many around the world – in visual splendour. Most generously, 100% of the profit from The Little Refugee will be donated to the Loreto Vietnam-Australia Program, run by the dedicated Sister Trish Franklin. The Little Refugee is published by Allen & Unwin. Visit Anh Do’s website to learn more about his inspirational life journey. Oh, there is just something so hysterically funny and freeing about the rudie nudie dash. We did it. Our kids all did it. The freshly washed and powered bare backside of a kidlet is something truly scrumptious as it flashes, peach-cheeked, by – on its way to rambunctiousness. In this latest romp by the talented Emma Quay, we meet two little poppets, fresh from the bath, quickly-towelled and still quite damp – who make a break for it. Off and out the door, over the floorboards, fluffy on the rug, lickety-split across the prickly doormat, tumbling through the fresh just-being-made bed – and out the door! Mum soon corrals the pesky nudie pair and it’s into fresh jarmies (rudie nudie no more) and snuggled under the covers for bedtime stories and a well-deserved sleep. Quay’s divine, sketchy illustrations do more than just delight the eye with their colour-blocked sorbet glory – they also perfectly convey the fresh and freeing tactile bliss children so enjoy with a rudie nudie run. The soft rug on a bare tum. The fresh sheets on sweet little shoulders. The dipping leaves of a backyard willow tree brushing little armpits – a tickly under there! The faces on these illustrated children is truly priceless – childhood joy and innocence in a gorgeous book that truly harnesses the physical freedom of being young. A new classic that all kids – big and little – will fall in love with. Be prepared for major repeat-readings. And some rudie nudie copy-cat dashes. Rudie Nudie is published by ABC Books. Don’t miss our interview with Emma right here on KBC. Hello, Emma, and welcome to Kids’ Book Capers! Tell us a little about you. I grew up in the English countryside with my sister Lucy, my music teacher mum, psychologist dad and two cats. I have always had an obsession with drawing and telling stories through pictures. At school I would draw for my classmates to entertain them, and by the end of primary school I was charging for my services as an illustrator and calligrapher of covers for projects – not my proudest memory, but my fees were low (a mere pencil sharpener or rubber). I met my Australian husband in India, and when I moved to Sydney I was introduced Mark Macleod who was the children’s publisher at Random House at the time. He offered my first trade picture book. It was a very exciting moment! Since that first picture book, in 1998, I have illustrated fourteen picture books, a handful of early readers and also written several picture book texts for very young children. I still live in Sydney and have two daughters. What genre do you generally write and illustrate in? For me, there’s nothing quite like early childhood picture books; I feel lucky to spend much of my time immersed in that world. I have [also] illustrated chapter books, book jackets and CD covers for audio books, but I always long to return to the colour and open space of the picture book format. I have been so absorbed in my illustrative work, printmaking and painting has been put on the back burner for a few years. I hope to remedy that. What do you love about writing and illustrating for children? I know a picture book can whisk (or sometimes gently scoop) people up and carry them along with it. It can make them laugh, cry, feel, relax. I love to reach children in this way. I am often reminded that a picture book has a life beyond its creators: I hear about children who request Good Night, Me every evening as their final book before falling asleep, and mimic the little orang-utan’s actions; children who think of Bear and Chook as their own friends. This is the most rewarding element of my work – knowing my books are a part of people’s lives, and being shared together by parents and children. I remember trying to write stories before I had learned to write. I would sit in my bunk bed, drawing rows of sequential pictures. They showed little girls getting into scrapes, and little boys were always the baddies. They weren’t cartoon strips, but I think ‘graphic novel’ would be too grand a term! I had a need to tell my stories, and I guess I still do. You write books with an inherent understanding of the very young. What inspires you to write and illustrate so creatively? That’s a hard one, but I think it might be memory (I can remember vividly what it felt like to be every age I have been so far), and (perhaps more importantly) observation – really looking. I have always noticed little details rather than the big picture. As a result, I think my books are probably about small moments in small people’s lives. Which comes first – the illustrations or the writing of a book? It’s difficult to know whether an idea arrives in words or pictures, but I’d say both go down on the page together as sketches and jotted words in a sketch book. A text, characters and illustrations grow from there (or don’t, if the idea isn’t up to scratch). You can see some of these sketch book scribbles on the ILLUSTRATING PICTURE BOOKS page of my website. Can you tell us about your illustrating process? My favourite stage is when the book can be anything – the early stages, when I’m scribbling away and not worrying what anything looks like: just getting the ideas down quickly. These then start to get weeded out and tidied into the tiny thumbnail sketches of a storyboard, followed by larger pencil roughs. The editor and author (if it’s not me), will have a say at these stages, before I embark on the final artworks. I often use the outlines from these roughs for the finished art to try to retain the freshness I seek in my printed work. Which mediums do you prefer to work in? I enjoy trying new media or combinations of media with each new project, and each new text will suggest a distinct illustrative approach as I read (or write) it. As a result, my work can sometimes have a quite different look from one book to the next. I like to challenge myself, and avoid becoming too slick in the execution of any one medium. I know I’m not making things easy for myself, but once I’ve tried something and it has worked, I’m looking for a new challenge. Some media I have enjoyed using are acrylic paints, brush and ink, soft pencils, wax crayons, chalk pastels, charcoal, relief printing and Photoshop. I find similarities between the building up of layers in Photoshop and the separate inked plates or screens of some of my favourite printmaking techniques… but Photoshop is nowhere near as messy. What inspired your new book Rudie Nudie? The book was inspired by the children of family friends – boys and girls – who would come for sleepovers and insist on doing a nudie dash after their baths. Even the shy ones couldn’t resist. Two little children – a girl and a boy – enjoy their bath time. But it’s when they hop out of the bath that the fun really begins, as these two rudie nudies soon escape their towels and dance out of the bathroom. While Dad makes the beds and Mum waits with their pyjamas, the little girl and boy skip and roll and prance around the house, and around the garden … until mummy calls them, and it’s time for bed. I get such a response from people when they hear the title of the book. Everyone seems to instantly recognise the term, Rudie Nudie. Do you have a particular fondness for one of your book characters? At the moment, I am particularly fond of the (unnamed) older sister in Shrieking Violet. Although it is her voice we hear throughout the book (she tries to draw our attention (and Mum’s) to her achievements as she leaps and rolls across the left side of each spread), she is invariably upstaged by her noisy little sister, as our eye is invariably drawn to toddler Violet and what she is getting up to on the right hand page. Perhaps I always go for the underdog (I’m rather fond of Chook, too), but I did make sure I let Violet’s sister get the upper hand towards the end of the book. She suggests the two of them put on a show, but it is obviously a rouse to steal a little more of the limelight for herself. Violet is assigned a non-speaking role, and when the sister flings off her cloak to reveal that indeed she is star of the show (and therefore the book), the cloak falls over Violet’s head. The sister will assure Violet she is a much more convincing tree with a green cloak draped over her head… and perhaps Violet will believe her! I am an older sister: that might have something to do with my choice. As a mum, too, I feel great sympathy for the exhausted but patient mother in the book. Describe one of your favourite ‘fan’ moments. I visited a remote school in north-west New South Wales a few years ago. The school had one class of ten students of various ages from Kindergarten to Year 6. I was drawing on a white board to show the children how one can use lines to change the expression on a character’s face to show how they feeling. I was using one of the pigs from my picture book, Reggie and Lu (and the same to you!). The kids watched in seeming awe as I turned the pig from happy, to miserable, to angry with a few flicks of my pen. I asked for a last request for an expression and a small, seven-year-old girl asked for ‘surprised’. I rolled out the wide open eyes and O-shaped mouth of the usual surprised-looking face, and turned around to see the girl looking utterly dissatisfied with my attempt. She assured me that pigs look nothing like that when they are surprised, and she knew because she and her dad surprised pigs all the time. I invited her up the front and she produced a stunning and graphic depiction of a wild pig caught in the glare of the hog lights and about to be shot! What’s a typical writing and illustrating day? I work from a studio in my home, and try to work on one book at a time. When I tell people what I do, they often say it must take a lot of discipline to stay on task and not wander off to the fridge or into the Internet. In my experience, the opposite is true. I get so engrossed in what I’m doing, I have to make myself get up and stretch or eat or answer some phone calls, to make sure I don’t end up with a hunched back and a twitchy eye. I love working on my own, but I also enjoy emerging from my studio for outings to the city to meet my agent, Selwa Anthony, editors and publishers. There are great contrasts in this job – I spend an age creating something, holed up in my studio like a hermit, and then (because of that something), I might be invited to a glitzy event which is so far from my studio it sends my head into a spin. I welcome the contrast, and enjoy both. My favourite books were Spike Milligan’s Silly Verse for Kids and Raymond Brigg’s Father Christmas. I was also a huge Snoopy fan, and spent hours with my Peanuts books. When I was very young, poor Dad had to read me The Elves and the Shoemaker over and over again. I can see a little bit of that naked scampering in Rudie Nudie. What else do you like to do, other than write and illustrate books? I like to do Pilates to iron out the kinks, play the flute, go to the cinema, eat and laugh with friends and family, travel, and visit inspiring art exhibitions. What advice do you have for those wanting to make a career of writing or illustrating? I wrote many, many letters when I first started out, enclosing colour copy after colour copy of my college illustrations (thank goodness for jpegs and e-mail now!). My advice would be to keep going, even if you keep hearing ‘no’. Don’t sit and wait for one reply at a time. Even while you’re waiting for a ‘yes’ or ‘no’ from one publisher about one project, don’t sit and wonder – start the next project. Keep creating: working, drawing, painting, writing, brainstorming. Hopefully you’ll be so inspired by the new work and ideas, comments from publishers about the ‘old’ work won’t dent your enthusiasm too much, and you’ll have the strength to keep going. If you don’t keep going, there definitely won’t be a ‘yes’. Oh, and by the way – I still hear ‘no’. What five words best sum you up? Bigger on inside than outside. What’s next for Emma Quay? At the moment I am working on the illustrations for another of my own picture book texts, called Not a Cloud in the Sky. It’s about a friendship between a bird and a cloud, and will be published by ABC Books/HarperCollins Australia in 2013. Learn more abut Emma and her beautiful books at www.emmaquay.com. Emma Quay captures all the joy and energy of childhood in this irresistible rhyming tale, featuring striking colour-blocked illustrations and priceless scenes that will have both tots and parents smiling from ear to ear. In celebration of the release of this gorgeous hard cover book, and thanks to HarperCollins, KBC has THREE copies, valued at $24.99, to give away! All you have to do is tell us, in 25 words or less, why your kids love a rudie nudie dash. Type Rudie Nudie in the subject line and email your answer to booksATtaniamccartney.com. Be sure to include your full name and address with your entry. Competition closes 11.59pm Sunday 13 November 2011. This is a competition of skill. Winners will be decided by Kids’ Book Capers, and no correspondence will be entered into. Don’t miss our interview with Emma Quay and a review of Rudie Nudie next week on KBC! What’s that noise in the deep dark night? Something spooky? That’s for sure. Creaking, whispering, something dropping. Could there be a stranger creeping through the house? When three little kids explore a creepy old mansion with torchlight and eyeballs wide with fright, they can never imagine their tentative meanderings may just be as scary – if not more so – for a resident ghost, happily minding her own business with her pet be-tentacled creature that lives under the bed. Who could possibly be more afraid? The invading children? The ethereal little girl? Or the reader? Using suspense-driven repetition, peppered with palpitating onomatopoeia, author Chris Cheng has penned a spooky tale that will delight children. A charming twist on typical ‘bump in the night’ fear lends whimsy and unexpected emotion to Sounds Spooky – especially when we learn about the death of our little ghost girl via newspaper clippings found in the house, and we can’t help but wonder where her parents are – and why she is all so sadly alone. The illustrations in this extraordinary book are a feat in construction. Sarah Davis has created a palette that defies and tricks the eye. Has she used oil paint? Clay? Computer-generated art? Photography? After spending considerable time examining the images in wonder, I raced to the back of the book, hoping for more information – and there it was … Davis has not only created models of each of the book’s characters, she even created an entire haunted house from cardboard and plaster! Combining photography, illustration and computer whizzbangery, the end result is an eye-fest that will entrance all ages. The fine detail is also extraordinary – from the detailed tiles in the kitchen to the gossamer ghost of a girl – this is beautifully-crafted work. Although Sounds Spooky is an all-round delight, I must admit, the highlight of the book for me was the faces on the children (and the ghost) when they finally meet. Sarah Davis has admitted this is also her favourite page – and it’s no wonder. I doubt the face of a real child could capture more priceless emotion. A breathtakingly book that’s at once laugh-out loud funny … and frightfully good fun. Sounds Spooky is published by Random House. Be sure to check out www.sounds-spooky.com! Paintings? Computer-generated art? Models? A blend? What the? Already completely enamoured with the superlative talents of multi-tasking artist Sarah Davis, I was simply quite boggled as to how this picture book was put together. It wasn’t until the end of the book that all was revealed (I love it when books reveal the artist’s medium!) 0 and quite astonishingly, Davis has not only created models of each of the book’s characters, she even created an entire haunted house from cardboard and plaster. You will be boggled by the astonishing detail, from tiles on the floor to dishes and torchlight and the most incredible gossamer ghost of a girl, who floats through the rooms of the house, trying to not ‘be scared’ by the strange noises in the dark… noises created by three cute and very brave little ‘invaders’ keen to explore a local haunted house. Yes, it seems Sarah Davis has scored the motherlode of artistic talent. Her sculptures in Sounds Spooky are extraordinary alright, but the highlight is the children’s faces, especially at the climax of the book – the emotion is breathtakingly good and laugh-out loud funny. Chris Cheng has penned a suspense-driven tale that will delight children, using a clutch of divine and inspirational onomatopoeia that really sets the spooky mood as our dear little ghost girls navigates her fears and those bumps in the night. Repetitive story elements will keep kids guessing, and really effectively build the drama. Spooky, charming and frightfully good fun. He’s cute. He’s fluffy. He’s small. But he has some big things to say. On friendship. On feeling lonely. On being brave. Today we welcome the totally squishable Squish Rabbit and his gorgeous author Katherine Battersby – with this exclusive (and v. cute) interview! Hello Squish, hello Katherine – so lovely to e-meet you! Oh, so cute! Tell me, has Squish always been small? Yes, Squish was born tiny and has hardly grown since. He’s so titchy he can sit atop a flower and climb inside a child’s sock. He’s often overlooked by larger rabbits and has a hard time being heard or understood. In fact, he’s so small he’s never really made a true friend. Until now of course! What do you think of the saying that the best things come in the smallest packages, and it’s the smallest creatures that have the biggest hearts? So true! Squish is a great example of these delightful sayings. Even more than being small, Squish feels small, which prevents him from achieving his dreams. But when another creature is in danger, Squish conjures the courage to intervene and discovers he has big and beautiful things inside of him. I have a lot of empathy for kids trying to express themselves in a world where big people often come first – I remember feeling that way myself. I think this is why Squish’s story is so important to me (Squish just did a little twisty jump, showing agreement – I believe this rabbit move is called a ‘binky’). Poor Squish. He’s just so little the other forest creatures don’t see him. Yes, he’s been trodden on, tripped over, run into, and sadly … squished. But he always bounces back! He’s a little trooper. And for those that have read his story, you’ll know what he discovers that means he’ll never be trodden on again. Does he still have an imaginary friend? Squish doesn’t let any friend fall by the wayside, real or imagined, but he has discovered that there’s much more you can do with a real friend. A pretend friend is rather hard to play hide and seek with (they’re not very good at searching). And they’re not so skilled at playing tag (running can be a problem). But they do have their positives – they’re very good at keeping secrets! How important is it to reach out to people who are smaller? What would Squish like to say to little creatures who are too scared to use a big voice? Squish says we all have special things inside us. He says not to worry about what others can do, but instead find those things you love. Find the things that make your heart sing. Once you’ve found those, it’s much easier to believe in yourself and find the courage to speak up. Believing in yourself is also sure to make you feel much bigger. Squish would also like to say something to you Miss Tania: great questions! Wow, Squish has never seen himself as a hero (he just did another little binky in excitement!). He’s quite a humble little rabbit, so more than anything he was just happy to have found another creature his size. And he also feels a little shy about the whole incident – after all, it may just have been his silliness that risked Squirrel’s safety in the first place. But Squish definitely did himself proud in the end. Are Squish and Squirrel still close? Very. I don’t think there have been two closer friends. As it turns out, Squirrel was feeling pretty small and lonely too. They do most things together now. Although they have quite different personalities, which I think can be a real strength in a friendship. They balance each other well. While squirrel is much braver than Squish, Squish is a deep thinker and very empathic. What do they like to do together? I wanted to ask Squish what you’re really like as an author? Squish has gone a little rosy-cheeked and shy at this question. If I could get him to fess up, I think he’d say that I am quite like him in many ways. I definitely feel small some days, and have trouble speaking up for myself and believing that I can do big things. But I do have some amazing friends in my life who help me feel strong and capable. Can you reveal a little bit about the next Squish adventure? Squish is living his next adventure as we speak, and I am racing to get it all down on paper, one page at a time. It’s another tale about a problem Squish encounters in being small – namely that there are many big things to fear. He’s most afraid of the dark, which is so big it’s everywhere. But one day Squirrel goes missing and it starts to get dark outside. I just hope Squish finds the courage to go out and find her. Thank you so much, Squish and Katherine for joining us during this very special Bunny Week on Kids’ Book Capers! Where can we learn more about what you’re up to? Squish has his own little animated book trailer and I have a website you can visit which may just have some secret rabbity surprises hidden around it … www.katherinebattersby.com. I also keep a blog, where I put all my latest projects and musings, plus the occasional new Squishy illustration. Squish also has a special page with his US publisher and his Australian one, too. Squish Rabbit is published by University of Queensland Press. Stay tuned for Dee’s review of Squish Rabbit – this Friday! Welcome Adam! So lovely to have you join us on Kids’ Book Capers to talk to us about what makes a great picture book. You’ve been writing some pretty great picture books for a while now. Why did you start writing them? Well I sort of had no choice. I started writing for children, and what burst out of me were picture books. The rhymes and images were in my mind and I had to let them out! I always wanted to write for children, possibly because they are closest to my maturity level. Writing in rhyme was exciting for me, so picture books were the perfect fit. Which part of the PB writing process do you like the most? The first draft. Just seeing something take shape before your eyes is awesome. But even the editing is kind of fun, when it’s not boring, because that’s where you get to the stage of reading it out loud and having that moment of, “Yes! That is how it has to be!” And then seeing the pictures is amazing too, seeing your words come to life through someone’s images. So basically I think I have covered the whole process. To cut a long story short, I love it all! What three elements do you think comprise a well-rounded PB? Gold, silver and potassium. Are they all elements? I think so. How embarrassing, I used to study Chemistry! Anyway, I think humour is number one for me. Having the illustrations and text complement and bring the best out of each other would be next. If one is much stronger than the other, the book doesn’t sit as a whole piece of art. Last, but most definitely not least, I would have to say respect for what children enjoy. I think picture books can get lost in being written for awards and adults rather than kids. These books are for children, and to write for children well you have to respect them and what they like. Why is humour so important? Because it’s relaxing. Because it opens up doorways for children to discuss things they may otherwise feel uncomfortable discussing. And because when children are being introduced to books and reading, you want them to enjoy the experience and laughter is not only the best medicine, it is the best thing ever. When children realise that reading and books are fun and interesting and exciting, that is what is going to make them want to read more books. Humour can do that. Do you think PBs should be heavy on lesson-learning and morals? No, says he who has written picture books on sharing, healthy eating and being positive. Look, morals and lessons are important to have in books for children, but not as a preachy, overbearing presence. If the lesson/moral is cloaked in humour and fun, that is even better. Dr Seuss was the master of this. Do you ‘test’ your books on kids before they are published? Sometimes, and sometimes I will read at poetry nights to adults as well. I have a couple of excellent readers for nephews, and they are always great to chat to for ideas and feedback, although I still haven’t finished one story I sent them the start of! Cathy von Chatterbox. I have to get onto that one day. How do the kids react to your books? By laughing like crazy … I hope. As most of my books are soaked with a good dose of humour, laughter is the main response, although I also get quite a few “eeeeewwwwwwwww!”s when reading them Better Out Than In. Just ‘cos there are a couple of mildly gross elements to the stories. What other elements do you use to make a picture book special for kids? Marshmallows help, but usually sugar free ones (is that even possible?). Twists are great. I am just reading Paul Jennings’ biography, and it discusses his use of twists. Kids like to be led the wrong way, especially if they can work out the twist before it comes. I think rhyme is a big thing I use too. For me, I like being able to punch a joke every second or fourth line. Rhyme also often helps the adults who are reading to the children get into a rhythm, and makes it more fun for them. Where do some PBs go wrong? What style do you NOT like? I don’t like picture books that seem more for adults, or awards, than for kids. I also don’t like really bad, forced rhyming. Or picture books that talk down to kids rather than treating them like the awesome, amazing human beings they are, capable of so much more than they are often given credit for. Or picture books that give children nightmares and they’re only five for crying out loud why was it so scary and it makes them wet the bed when all they wanted was a cheerful goodnight story with their … oh. Wait. I have said too much. What’s more important – the text or the illustrations? Oooh, tricky one! Both are so important, although as The Arrival showed, sometimes text isn’t needed for a picture book to be amazing. I don’t know the answer to this one, and I have just gone cross-eyed. Okay. I think both are equally important, but both must do the job they are there for. We don’t need the story describing everything we can already see in the pictures, and the pictures must bring the text to life, not go off on tangents. When they work together and are both as strong as each other though, that’s when magic happens. What are some of your favourite PBs? There are SOOOOO many, but I grew up on (as in read while I was growing up. He wasn’t on the floor of my house or anything) and still love the master, Dr Seuss. My two favourites of his are The Lorax and Oh, The Places You’ll Go. Another author from my childhood I am still a massive fan of is Bill Peet. My faves of his are Huge Harold, The Pinkish, Purplish, Bluish Egg, and The Whingdingdilly. Shall I go on? Okay, I will! Just one more. I also love The Short and Incredibly Happy life of Riley. Which PB do you absolutely wish you’d written and why? Harry Potter. Does that count as a picture book? There were pictures in some of them! No, I’m just kidding, of course. I would have loved to have written a Dr Seuss book. Any of them really. Just to have that magic coming off the page, and I truly believe there is magic in the way he uses words. He was a genius. See more on Adam ‘Wally’ Wallace and all the wonderful picture books he’s penned, at www.adam-wallace-books.com. Once there was a grumpy little king. He was always grumpy – every day and all day long – because he was tired of being a little ruler in a little nation. He wanted to be a big ruler in a big nation. His advisers knew just what to do. Start a war. If the king started a war, he could become world-famous, and his country would soon expand. The grumpy little king loved the idea. He called his general and amassed lots of big guns and tanks and planes and explosives. Then he recruited bakers and farmers and builders and turned them into soldiers. Then he picked an ememy – the lanky king – and packed his men off to war. The grumpy king’s men faced the lanky king’s men on the battlefield. Guns were drawn, they were ready to fight – but wait! Hang on a second! Where was the grumpy little king? Why, there he was – at home in his palace, sipping a nice cup of tea! ‘Not on your life!’ thought the soldiers, who gathered up both their kings, stood them in front of each other, gave them guns and then packed up their gear and went home. Can you imagine what the kings decide to do? After working as an illustrator in London for several years, German-born Michel Streich moved to Sydney in 2000. He has been published in several formats and has an inherent passion for human rights – a characteristic that becomes more than apparent in this thinly-veiled tale of madness. Clever, witty, biting, funny, sad and flagrantly showcasing the ridiculousness of war, Streich has hit every mark with this beautifully-written picture book, which will appeal to both the very young and the very old. Featuring illustrations so charming you want to gobble them up on toast, Grumpy Little King is a classic in the making. It’s also important. Grumpy Little King is published by Allen & Unwin. You can learn more about Michel’s work here. Kids’ Book Capers is thrilled to welcome two very special guests – Phil and Josh Undy, superstar lead players from Michael Wagner’s junior fiction series The Undys. Welcome Phil and Josh, it’s so lovely to e-meet you! Josh: Thanks, it’s nice to e-meet you too, Tania. Isn’t it Dad? Dad? DAD!? Phil: Oh, sorry, Joshy-boy, I got distracted. There’s a dead fly on the window sill. It’s upside down. And still buzzing a bit. What was the question? Josh: It’s nice to e-meet us, isn’t it? Phil: Yes, it e-is. It’s great to e-meet e-us. It’s been said that you are a pair of true pranksters and game-players. Tell us about your antics and which ones you love best. Josh: Well, we just play games whenever we’re bored. And it doesn’t really matter where we are – we’re pretty good at making up a game on the spot. We play Gut Barging and Toe-Wrestling and Run ‘Til You Stop and all sorts of other made-up games. Phil: Yeah … I agree with what Josh said. Well said, Joshy-boy. You are also highly competitive. Who tends to ‘win’ between the two of you? Josh: Want to thumb-wrestle right now? Phil: Better not, I think Tania’s got another e-question for us. I do have another question. Who would you say is the smartest? [Stares speechlessly for a moment.] Ummm … what about the best looking? [More staring.] Err … the funniest? Josh: We’re not actually funny. Phil: No, we’re more just stupid. Josh: There’s a slight difference. [Smiles awkwardly.] What sums up your father/son relationship? Josh: One second. Hey, Dad, look! That’s fly’s buzzing again. Josh: While Dad’s distracted I’ll secretly tell you that he’s the best dad in the world. By a million miles. Phil: … wow it must be getting close to its last buzz by now. [Smiling warmly.] Can you tell us more about Mum? Josh: Um, that’s a bit of a sad thing to talk about. Phil: It’s okay, we can just say it quickly and then keep going. Tania, Josh’s mum, died from cancer when he was four. She was the most beautiful and kind person in the world. And I promised her that when she was gone I would be the best mum a dad can be. And I’ve tried to live up to that promise, every day. Because she really deserves that. Josh: And now we have Amy. Phil: That’s right. We’re very lucky. I was so sorry to hear about Mum. I know you will always hold her close to your hearts [pause for some hugging]. Phil – how do you feel about Josh calling you Butthead? Phil: I don’t really mind – even though I know I should. I think he only does it because we’re friends as well as father and son. It’s like we’re mates, really, isn’t it Joshy-boy? Your game rule is this – “whatever happens, happens”. What does that mean exactly? Josh: That just means that you never stop the game to complain or whinge or carry on like a pork chop. You just keep playing no matter what happens. It sounds like an easy rule, but it’s not. It’s really hard. Phil: It sure is. Sometimes I really want to stop and mope, but that rule says I can’t. It’s tough. You’ve already starred in six rollicking Undys adventures – which has been your favourite and why? Josh: I think my favourite game is in the green book, Itching for Action, where we play Total Embarrassment with Aunty Faber. But I love all the books just the same. Phil: Total Embarrassment still gives me nightmares. Eeek. Josh: It was great, but I did actually write it myself. Michael Wagner says he wrote most of it, but it was really me. He’s just competitive about who wrote the most. Some people are weird like that. Phil: Yeah, he’s very competitive. Strange. Okay then … so, what’s Michael Wagner really like? What about illustrator Gus Gordon? Describe yourselves in five words. Josh: Cool … really nice … the best! Phil: I think we went over five words. Josh: Woops. One last one – power-packed! Can you give a sneak peek at your next adventure? Josh: Michael Wagner says he’s writing about some action-packed teddy bear at the moment. So he’s not able to help me write more stories. As if a teddy could be as good as us!? What a shame! I hope we can read more of your adventures soon. Where can people follow you online? Josh: Just go to Michael Wagner’s website and blog. Where are they again, Dad? Phil: On the Internet, I think. Josh: Dad! What are the URL’s? Phil: Thanks Tania. It was e-lovely to e-meet you. The Undys Series is published by Puffin and is ideal for kids aged between 7 and 12.
Review – Come Down, Cat! Nicholas is worried. ‘Come down, Cat!’ he calls. But the cat just says ‘Marl’. How can Nicholas get the cat to come down? He fetches a ladder but the cat is off across the rooftops, way out of reach. It looks like the cat will have to stay on the roof. For the night. Dark soon descends and Nicholas worries his furry little friend will be spooked by nighttime monsters and ghosts and creepy crawlies, but the cat seems unaffected and serene. What a fearless little cat, thinks Nicholas. Pitter pat. Drip drop. What is it that a cat truly fears? Not the ghosts and monsters and crawling creepies prowling around the darkened garden … could it be something far more sinister, something completely fur-wracking – could it be … rain? Gorgeous illustrations by Lucia Masciullo have a folksy, whimsical quality that lend this story a somewhat fable-like feel, and effect a delicious energy and mood. A simple, charming story about fear, fearlessness and the relativity of perception, Come Down, Cat! is a warming tale of loving friendship that will make children think as well as smile. Come Down, Cat! is published by Viking (Penguin) and teacher’s notes are available at the Puffin Books Education Centre. When I opened the satchel and pulled out a sheath of cobalt blue dust jacket, slapped with the bright punch of Dr Seuss artwork, my heart took off instantly at a gallop. It galloped so hard, I had to press this hard cover book firmly to my chest to stop it busting through my ribcage. Such is the power of Dr Seuss. And most especially the power of some long ‘lost’ stories, complete with original artwork, begging to enter the mainstream consciousness of both longtime Seuss lovers and those who are embryonic to the Ted Geisel phenomenon. For that, Random House Books USA and HarperCollins Australia, I thank you. The discovery of these stories is an interesting one. Located quite by accident by self-confessed Seussologist Charles Cohen, all seven stories were originally published in Redbook magazine in 1950 and 1951. Upon making his eBay discovery, Cohen quickly bought up as many original Redbook magazine copies as he could and began re-listing them on eBay, touting them as containing original ‘lost’ stories by Dr Seuss. The magazines soon came to the attention of Cathy Goldsmith, VP Associate Publisher at Random House Books in the US, who quickly snapped up several magazine copies before exploring the option to republish the series in a collective tome. Each story is pure Seuss at his best – a collaboration of colour and candour, whimsy and wackiness, rhythm and rhyme that eternally defies everyday and leaps into exceptional. There are no surprises here. Just more heart-warming delight – made even better for the fact that they just may have forever been ‘lost’. The appreciation one feels over this fact is palpable. From the cat and the duck and their outrageous intention for a wee little seed, to a bear and a rabbit with a penchant for pointing out eyelash flaws and a set of twins who learn how cosy it really can be to be two peas in a pod, the tales are pure rhythmic joy. It’s interesting to note that the story Gustav the Goldfish later became A Fish Out of Water by Seuss’s wife Helen Palmer (illustrated by PD Eastman) – and it’s such a thrill to see the original illustrations, featuring Seuss’s iconic flair. The only question I have about The Bippolo Seed and Other Lost Stories is why each tale wasn’t made into its own individual book. How glorious it would have been to add seven new tomes to our beloved collection … but I can only presume the scant illustrations made individual books an impossibility, without adding to and thereby corrupting the purity of this beautiful original work. No matter its form, I’m in Seussy heaven. The Bippolo Seed and Other Lost Stories is published by HarperCollins Australia. You can see the trailer on how the stories were discovered here. It’s such a thrill to be blogging alongside my talented friend Dee White on the Kids’ Capers Book blog. Via its myriad blogs, Boomerang Books provide an invaluable source of information and commentary on all manner of books (though I must admit – Kids’ Capers has been my personal favourite) … so you can imagine how exciting it is for me to take part and to share my deep love of children’s books with you. I have been writing stories since I was a child, and my infatuation with children’s books – picture books in particular – was certainly steeped and boiled in a childhood of literary wonder. It wasn’t until my teens, however, that I began seriously collecting picture books. I think, way back then, it was the old ‘glory box’ thing … collecting books for my future children alongside the tacky housewares I simply couldn’t live without (and have long since disappeared, hallelujah, although I think a 70s melon baller may have survived the cull). When I became a mother, my groaning picture book tally reached the hundreds. Fuelled by the various stages of my children’s development, the collection was weighted heavily by all manner of genre and style – sparkly-feely board books, Disney fairy princess tomes, look-and-find, ABC, colour, number, cool facts, early reader, Ladybird, chapter, picture, verse, and yes yes – there were even the dreaded licensed character books and paraphernalia, stuffed deeply into the shelves alongside my very own vintage Blytons and Scarrys. It was a heady and addled mix, each book standing alone in its acquisitions history … I could pretty much delineate where each and every book came from and how it made it into our house, from the McDonald’s happy meal freebies to the rare and vintage Coles Funny Picture Books sourced online … I knew each and every book intimately. I was crazed with it, obsessed by it – until one day, soon after I began Kids Book Review and my book tally careened into the thousands, I knew it was time to cull. To let go. To move on. I probably slashed the collection by half, if not more. It wasn’t easy. There were books I detested but clung to for the memories – Riley falling asleep at night clinging to a Superman: The Movie paperback that exceeded his years by five, Ella carting a discount fairy sparkles groanfest from room to room before sitting down with her plastic teapot to serve it tea. There were books that had skipped the kids’ age bracket by seemingly decades. There were those that were just too average. There were those that were good but provided me little emotional attachment and those that were incredible but for some reason, still didn’t ring my literary bell. So I let them go. I released them into the world where others could make the heady emotional attachment books do so well. I feel so blessed to be working in a field where an almost incalculable amount of books – from baby board books to adult non-fiction – pass my way. As is the way with subjectivity, some stay awhile, some visit briefly, some nestle into a corner of my heart whereupon they will forever reside … and although I have fallen head over heels in love with books of every genre, it’s the picture book that continues to hook my heart. Maybe it’s the evocative way the pictures complement the text. Maybe it’s the way such succinct text incites the imagination. Maybe it’s the cleverness and humour and surprises great picture books provide us. Or maybe – just maybe – it’s that intimate connection to a childhood long past and never reclaimable … that link to the innocence and wonder of being very young – a time when books simply overwhelm us and shape the very people we become. Whatever the genre, I will never release my children’s book addiction … it’s as much a part of me as breathing – and picture books have the added advantage of being able to tell a story without a single word. After all, doesn’t a picture paint a thousand of them?